Mr Mo is one of the nicest and most helpful residents in all of Dillydale. Then one day, he visits the barber for his regular snip, and falls fast asleep in the chair. When he wakes he discovers his mo is long gone - and so too are his manners. All of Dillydale is thrown off kilter, but as Mr Mo's moustache starts to grow back, the balance is restored. As I mentioned in my forts post for November, I can't actually participate in Movember in the moustache growing capacity, but that doesn't mean there aren't other ways to support the cause. 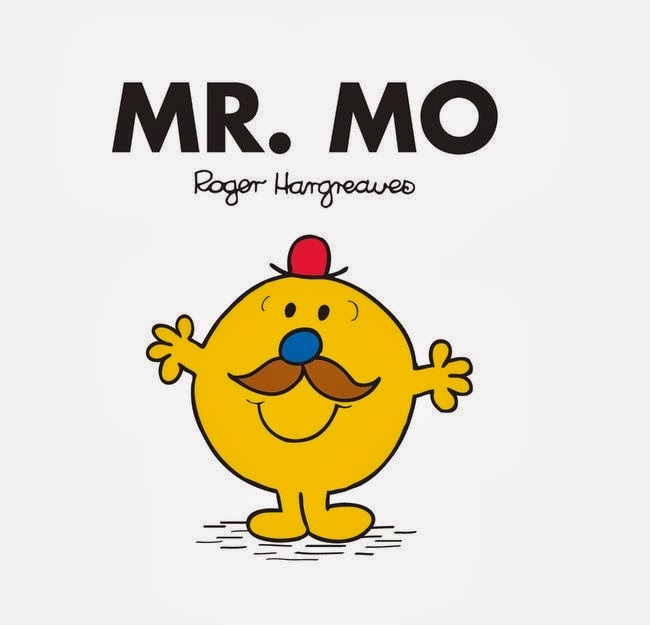 Which brings me to Mr Mo, a brand new hardback Mr Men title, released especially to support Movember. As the blurb states, Mr Mo is the nicest person in town, he has the best manners, and he is kind...he is a gentleman. These attributes are in part due to the fine moustache Mr Mo sports, and when he accidentally gets it cut off he becomes thoughtless and rude. As his moustache grows back, his kindness returns, and he encourages the other men in town to try growing their own Mo's. The result is noticeable better manners and a lot of marvelous moustaches!